The weekend is here. I have no idea why, but this week has felt like it has gone on forever. This morning I get to go to a Roman Festival for my son’s 3rd grade class. I have no idea what it will entail, I just know I had to send in 3 cans of black olives for the event. My son loves Greek and Roman mythology, so I am sure he will have a great time. In 2nd grade they had the Greek mythology unit, and he was in heaven. Before I forget. Head over to my Facebook page for a giveaway going on. It ends tonight at 6pm EST. 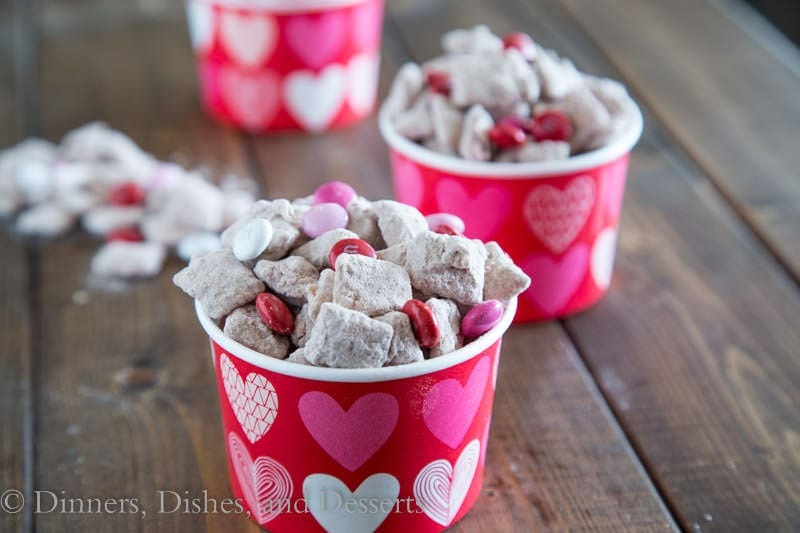 Valentine’s Day is just a week away. 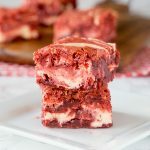 Next week I am going to my son’s class to help with their party. I really wish I was allowed to do anything other than just store-bought stuff at his school. 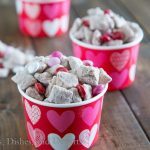 This puppy chow would be so much fun to give as Valentine’s gifts to the other kids. 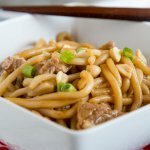 Or even to make with the kids. 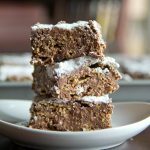 All you have to do is melt some chocolate, mix with cereal and toss with cake mix and powdered sugar. So easy, and great to have the kids get in there and help. 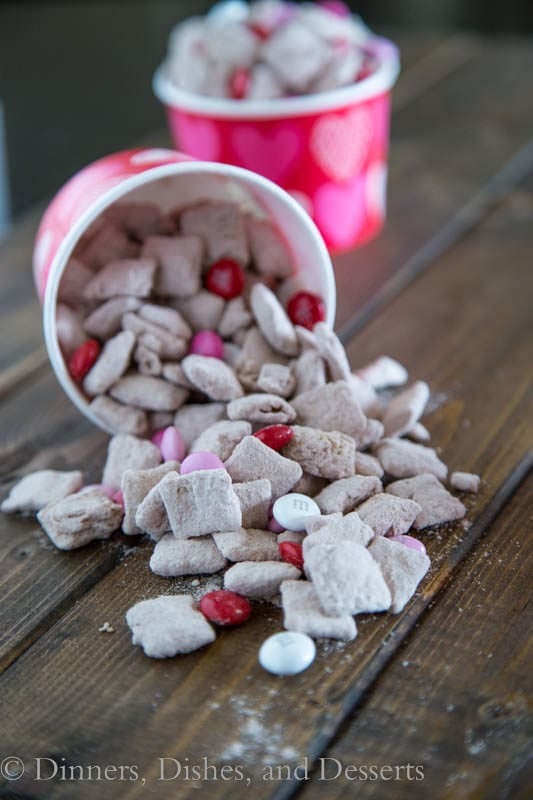 Red Velvet Puppy Chow is kind of embarrassingly easy to make. It is more of a method than a recipe. 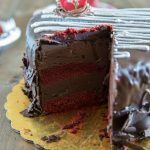 If red velvet isn’t your thing, pick another flavor. Chocolate, Vanilla, Funfetti, pretty much anything goes. That also goes for the variety of Chex cereal you use. Rice, Corn, Vanilla, Chocolate etc. So many fun different combinations that you could come up with. I couldn’t pass up the Valentine’s Day M&M’s at the store, so I added a few in for color. If you don’t have them on hand, feel free to leave them out. 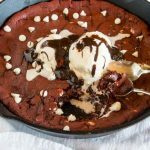 But adding more chocolate is never wrong, in my opinion! 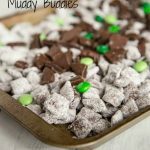 Quick and easy Puppy Chow (Muddy Buddy) recipe using Red Velvet cake mix. 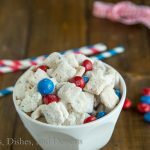 In a large bowl mix together Chex cereal with melted white chocolate. 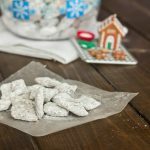 In a large resealable plastic bag mix together cake mix and powdered sugar. Add coated cereal to the bag. Seal and too to coat evenly. 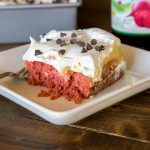 Pour on a baking sheet. 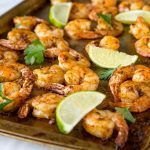 Spread evenly to cool. 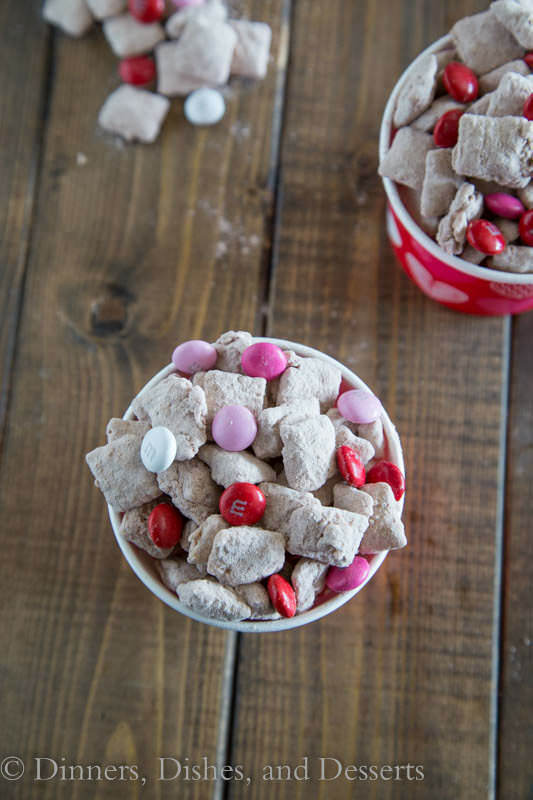 Once completely cool, toss with M&M's. 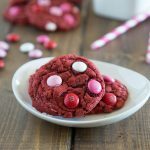 Pink Velvet Cookies & a GIVEAWAY! 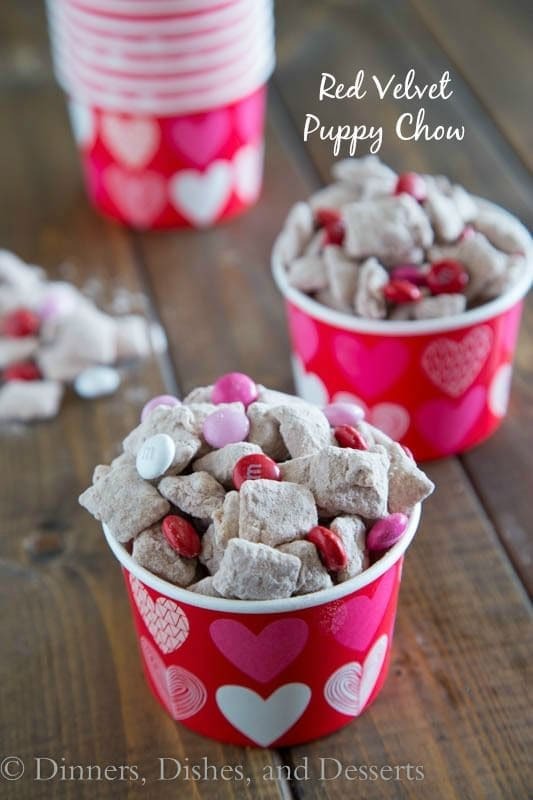 BIG puppy chow fan here …. 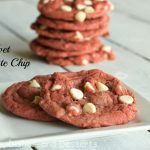 made peppermint and chocolate peanut butter for New Year’s and people always love it! Addicting. 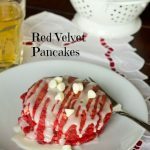 I am going to make this Red Velvet batch for my boyfriend and send for Valentine’s Day! He’s going to love it! 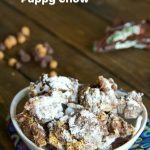 Love how many flavors of puppy chow one can make, especially with cake mixes! YUM. 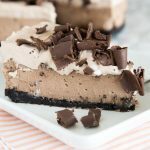 I might make this and bring it into the office for all to enjoy. Can I have a huge bag of this?! And I just have to throw this out there – I HATED the mythology units in school. Why?! Why did we have to learn that stuff?! All the Percy Jackson books got him very interested in mythology. He has read every single Rick Riordin book there is.